Ubisoft is promoting its new Rocksmith video game with “Guitar Baby”, a video clip which has been viewed over 2.5 million time since its launch in June 2011. A baby and his day play air guitar riffs in a home-made movie, shot with a hand held camera by an off-screen Mom character. The viral opens on a dad in pajamas, noodling with an electric guitar on his couch as his infant child sits beside him. He stares at the television screen, following along as the game – which allows players to plug in a real guitar and play along – gets started. He struggles to keep up with the game’s rendition of the Black Keys song, “I Got Mine”, before handing the guitar over to his beckoning baby. 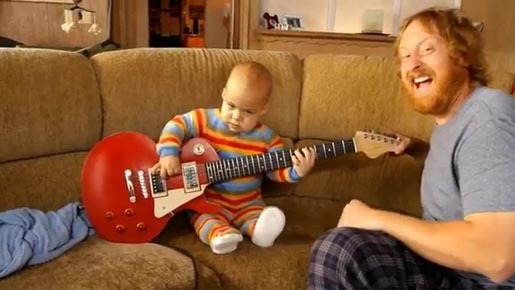 The baby proceeds to play the song’s hard-rocking guitar riff expertly for several seconds before handing the guitar back to his amazed father with a high-five and a flash of the rock ‘n roll “horns”. The spread of the video, mainly through social media, sparked a great deal of online conversation about how the baby’s virtuoso performance was acheived, with many viewers incorrectly theorizing that the effect involved CGI. The Guitar Baby spot was developed for Ubisoft at Cutwater, San Francisco, by executive creative directors Chuck McBride and Travis Britton, integrated producer Daniel Tuggle. Visual effects were produced at A52, Santa Monica, by VFX supervisor Glyn Tebbutt.